Name: Clynelish Former name: "Clynelish A"
Contribute(d) to the following blends: Johnnie Walker (gold) and black & white. Note: The two distilleries on the site were called Clynelish. This entry correspond to the new distillery. For the old distillery, please refer to Brora. From left to right: An old Clynelish 1974 from the Rare Malts collection, the Clynelish 1982 Fauna & Flora, Clynelish Distiller's edition, the Clynelish 14 YO and the Clynelish 1997 Manager's choice. 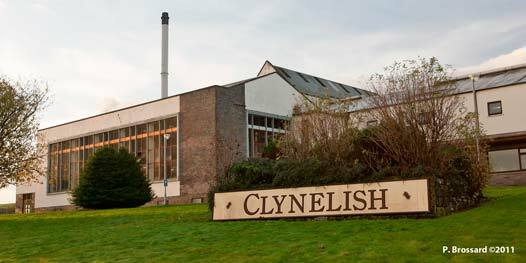 In 1967-1969, DCL built a second distillery at the Clynelish site, also named Clynelish, certainly a way of letting the new distillery benefit from the name's huge reputation. Meanwhile, the old distillery's mash-house was rebuilt This period is confusing and different versions have been written. This version seems to be the most accurate: The new Clynelish was in operation from August 1967 on and the old Clynelish was closed in August 1968. From August 1967 to August 1968 both distilleries were working in parallel and were recognized internally as Clynelish A (the new) and B (the old). During this short overlapping time, casks from both distilleries were stencilled 'Clynelish' and the Scotch Whisky Association (SWA) forced the proprietor to change the name of one of the distillery and the old distillery reverted back to a name it was said to have carried on and off for short periods on and off during its early history: Brora. Between 1969 and 1983, both distilleries functioned in parallel. Since 1983, only the "new" Clynelish is operating and it has not changed of owner since its construction in 1967. The product from this distillery can be recognized by its "waxy" character. For an unknown reason, this character is associated with the spirit receiver. Source: Distillery visit, The Magical History of the great Brora Distillery by Serge Valentin,The Making of Scotch whisky by John R. Hume & Michael S. Moss, The Whisky distilleries of Scotland and Irelandby P. Morrice, The Scotch whisky industry record by H. Charle sCraig, The Scotch Whisky Distilleries by Misako Udo, Rare Malts, Facts, Figures and Taste by Ulf Buxrud and The DCL Distillery Histories Series by Brian Spiller.